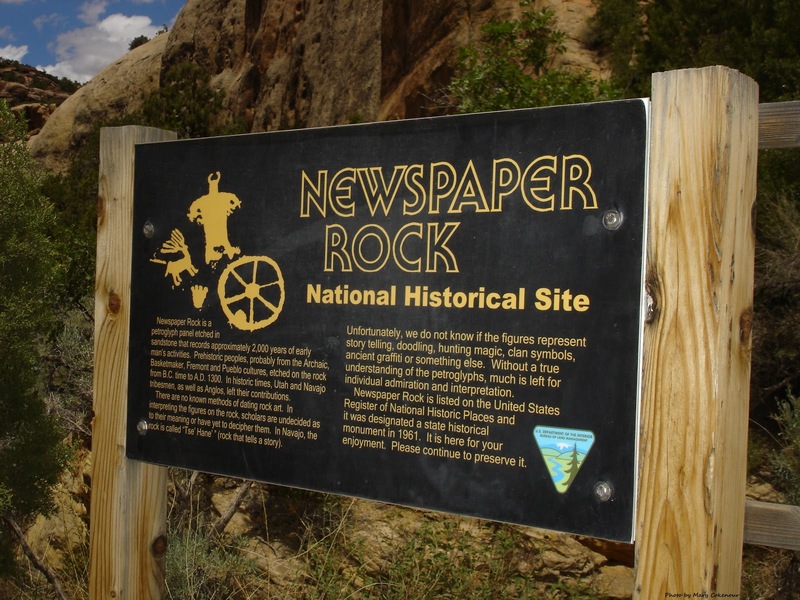 The Southwest Through Wide Brown Eyes: Newspaper Rock and a Surprise Down the Road. In yesterday's post about Monticello, Utah, I mentioned that the mountain road eventually loops down and comes out on Route 211. By the way, the name of the road is called Harts Draw Road; and Indian Creek camping grounds (tent and RV sites available) are nearby also. Unless you want to do a U-turn and go back through the Abajo Mountains again to Monticello; there are two other options. Option One: make a right turn and travel East to Route 191; on the way you'll see a small ghost town called "Marie's Place" or "The Home of Truth", but that's for another blog post. Option Two: make a left turn and travel West going towards Canyonlands; there are many points of interest this way and I'm going to write about Newspaper Rock today. Traveling West for a couple of miles...stop! Ahead of you are the Abajo Mountains stretching westward. Now look behind you to the East; those are the La Sal Mountains in the distance. 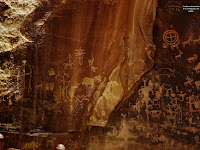 Newspaper Rock has been dated back about 2000 years and no one really knows the true meanings behind the drawings. They could be messages, ritual symbols, stories or simply artwork; and which culture contributed which drawings is uncertain. 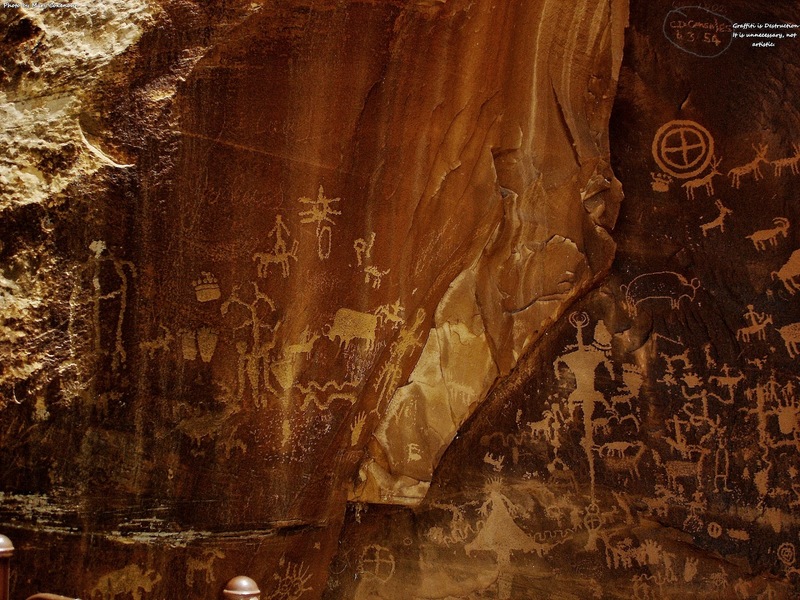 Unfortunately it has been defaced, as many of the petroglyph areas have been, by, for lack of a better word, stupid people who believe their initials/names and dates are important to the rest of the visitors. While having a "guestbook" for visitors to sign might be helpful, these idiots would probably find a way to deface that also. Humanoid and animal figures are distinctive; as well as the sun, two figures touching a tree, the spiral, the wheel and the plus (+) symbol inside a circle which many believe represents the element of Earth. There are some spectacular views as you look around the area also. 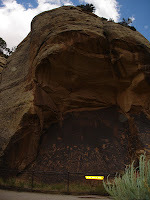 If you happen to be wondering, there is a small parking area at Newspaper Rock with restrooms at one end. The walk to the actual wall itself is only about 1/10th of a mile; and so worth the minuscule effort. 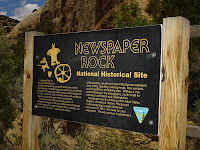 Now when you leave Newspaper Rock to travel further towards Canyonlands, don't be in such a rush to speed down the road. First off, the surrounding scenery is gorgeous, but secondly is what is waiting to be seen only 1.8 miles down the road. Look to your left (South) and you will see a jug handle arch; it is easily visible going West, but coming back East you cannot see it. There is a small pull in area nearby, but you will still have to walk up the road a bit to be able to take a decent photo. Now in Moab, Utah there is an arch on Potash Road called Jughandle Arch; I'm calling this one a similar name for want of a better description. It looks like a jug handle; I cannot find it named on any maps and when I ask about it, no one seems to know a thing about it. 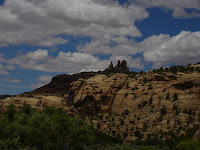 Perhaps everyone is too busy speeding between Newspaper Rock and Canyonlands to notice it, but I happen to enjoy the scenery, so speed to nowhere. Consider this blog post your first appetizer for Route 211; there is definitely more to come.